This piece was orginally written for and is cross-posted at Librarian Burnout. Special thanks to Maria Accardi for encouraging me to write this! And thank you also to Kelly McElroy and Jenna Freedman, two of my zine librarian pals, for your encouragement and guidance in both creating and making available my first zine. Under this blog’s title is a tagline and an invitation: “what we talk about when we talk about burnout”. I’m burnt out on assessment. Many who read this particular blog will likely see that statement and say, “Oh yes, indeed, been there (and maybe still am).” This helps me, because believe it or not, I am not in the mood to use words to analyze why I’m burnt out on assessment. Most of it feels too self-evident for me to do that productively. But even for the parts that aren’t self-evident, writing words about why assessment, as it is structurally and institutionally handed down to librarians like me (which may not be the ‘ideal’ of what assessment could be, but is still my present reality)...writing words about this isn’t going to help me right now, because at the end of all those potential words, I still need to do assessment. Words can be powerful. The act of naming things helps us understand them better. And by understanding them, we may* have the capability of doing something about them (i.e., reflection into action). But the words I have inside me, in reference to assessment, are a mess that I’m not ready to shape into something fit for public consumption. So I made a zine instead. I took a thing I feel, in ways that are pretty big and overwhelming, and I turned it into a tangible thing that tells a small part of the story of what’s happening inside me in reference to assessment. And it helped. There are of course words in my zine--including what can only be described as bad (but satisfying!) poetry, written by yours truly. So words certainly helped me along here. But zinemaking also involved cutting with scissors, writing things out in pen, drawing pictures with highlighters, and shaping the space that falls between the boundaries of the zine template I chose to use to tell the story I need it to tell. The specific aspect of assessment I'm burnt out on right now is rubrics--writing them, teaching with them, and scoring them. 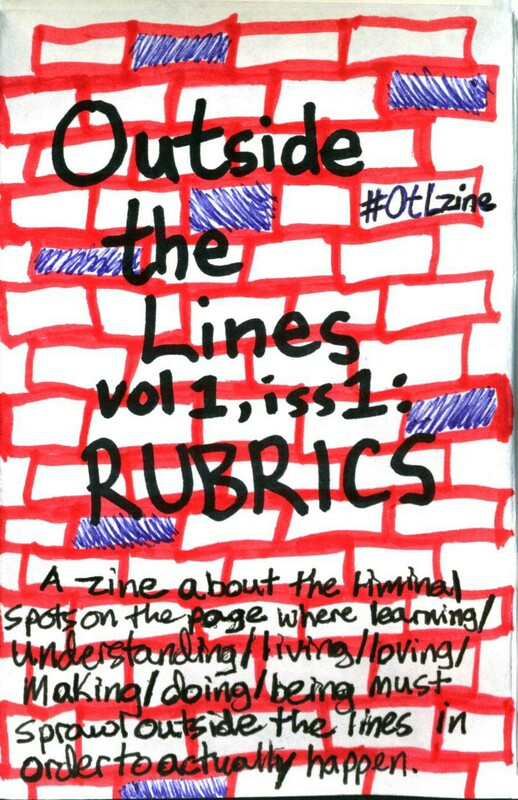 So I turned my burnout about rubrics into a zine. This process challenged me to shape my burnout into something others can see and engage with, and my feelings about this one part of assessment have now been named, not through a detailed text-based analysis, but through and in a zine. Which I made out of my burnout. It’s the best act of self care I’ve done this summer (with a close second going to taking up coloring). And Maria has encouraged me to share it with all of you. Using that red highlighter was sooooo satisfying. There are so many things in my life, both professional and personal, to which this idea--this tension between order and sprawl--applies. Rubrics are the topic of volume 1, issue 1. I’m hoping to create a new issue twice a year on a different topic each time. 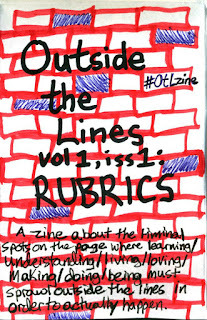 I want to make zinemaking a part of my praxis as an academic instruction librarian (to bring this back around to the project of this blog). I learned this summer that taking my burnout, and turning it into something material that tells at least a small part of the story going on inside me, helps me see it clearer, understand it better, and shifts my feelings toward it from burneverythingdownrightnowrageragerage, to “hey, look at this rad thing I made out of that crappy feeling”. It’s hard to explain why this shift matters, but it does. It makes it so I can face fall semester, during which I know I will have to write, teach with, or score at least one new rubric. It also makes it so I can go through fall semester keeping an eye out for other things about which I have that ragey feeling, so I can target those things as topics for future zines, transforming my feelings about them into something satisfying and tangible to share with others. It’s like I have a new twice-a-year therapist, made out of paper, post-its, pens, scissors, glue, and highlighters. So even when I can’t write out in detailed language what my burnout is like, I’ll now be able to talk about my burnout through the regular act of zinemaking. And knowing this makes facing my next task involving (effing) rubrics palatable. *I say “may” because, even if analysis leads to deeper understanding about a problem, and even if that in turn leads to ideas for how to change the situation to make it better, so often there are structural barriers in place that make putting these ideas into action impossible or close to it.